A very similar week to last is on tap for eastern Colorado as our weather looks to start dry and warm and end cooler and unsettled. Highs Tuesday will be our warmest of the year it looks like, with MOS guidance printing highs in the mid 90s for Denver. It'll be even warmer than that across southeast Colorado where highs could approach the triple digit mark by Tuesday afternoon. 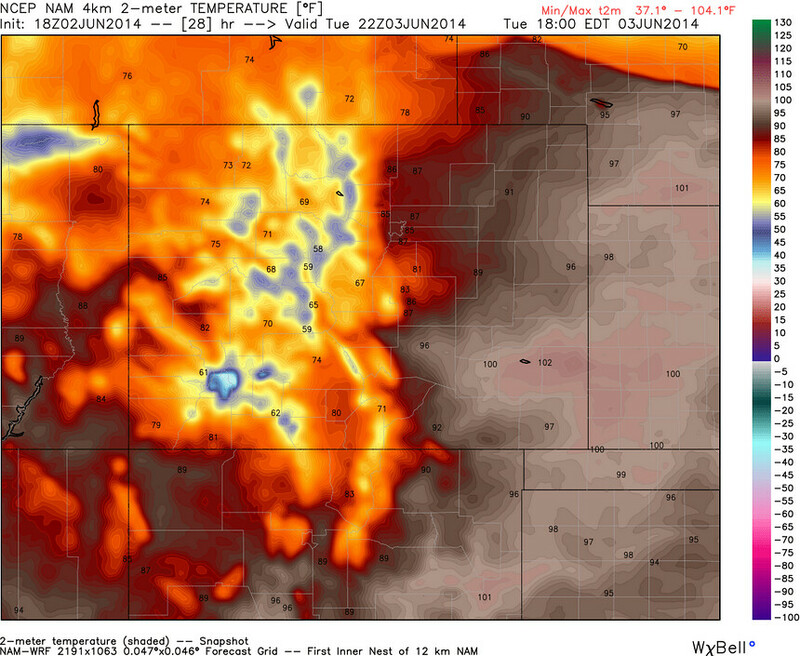 Check out the 2 meter temps the NAM has for tomorrow afternoon for southeast Colorado (though notably cooler for Denver). With the warm temperatures Tuesday will come an increased fire danger for southern and southeastern Colorado. Relative humidities are expected to be in the single digits for this part of the state, with gusty winds and widespread highs in the upper 90s. A Red Flag Warning is goes into effect Tuesday morning, and will remain so into Tuesday night. No outdoor burning Tuesday, please! There will be a chance for severe storms Tuesday across extreme northeast Colorado, but chances will be low for these locales. 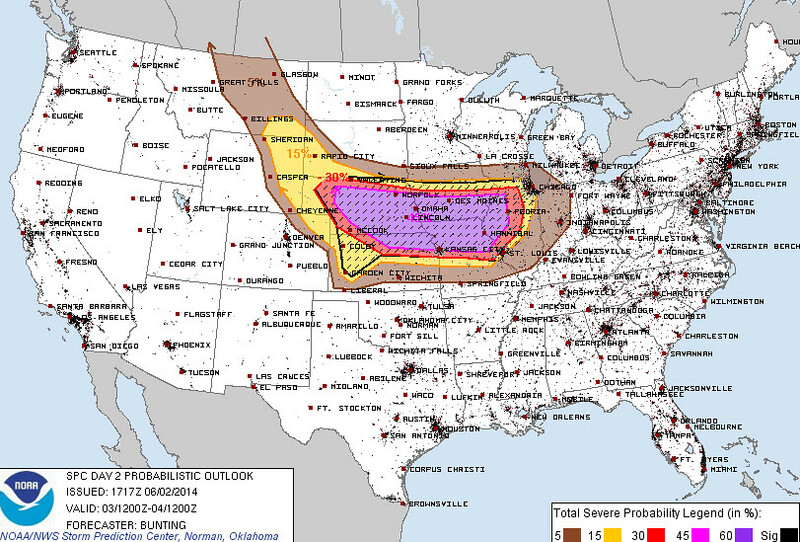 The greatest threat will be east of Colorado where the Storm Prediction Center has issued a moderate risk outlook for portions of Nebraska, Kansas, Iowa, Missouri, and Illinois. These storms will be capable of producing large hail, damaging wind, and tornadoes -- some of strong -- well into Tuesday night. 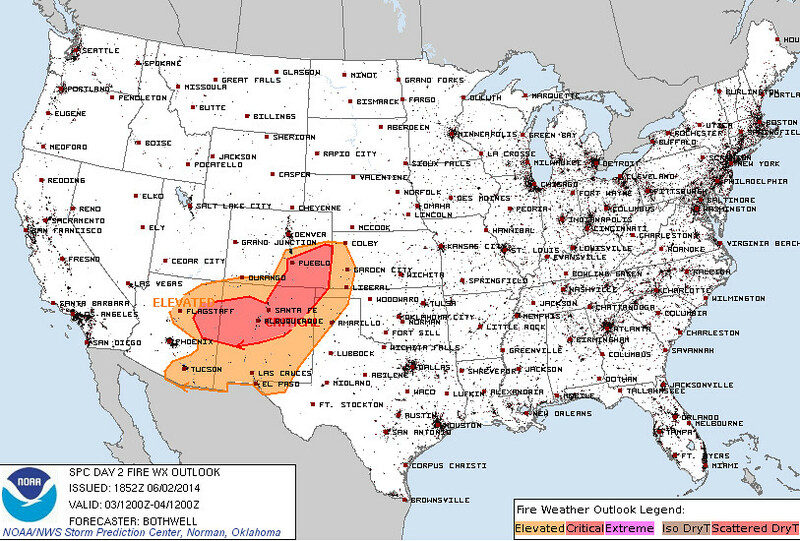 This is a large area of moderate risk which includes some highly populated areas like Lincoln and Omaha Nebraska. The damaging wind threat will increase into Tuesday evening as a large MCS forms and pushes east Tuesday night. If your travel plans take you northeast or east of Colorado Tuesday, please plan accordingly and stay tuned to local NWS and media for the latest. Cooler temperatures should start to work their way into the state for Thursday, but how much cooler for eastern Colorado will greatly depend on where and when afternoon storms develop. We do see a return of moisture to the plains by Thursday, but we may be lacking some ingredients for development in the metro area -- time will tell. Both the GFS and EURO both have a decent chance of afternoon storms returning to end the week, and possibly through the weekend. Several waves of energy will pass through the state over these days, with enough lift and moisture to spawn these storms. Area coverage will again be spotty, as it greatly depends where the strongest storms develop, but should have a better handle on this as we get closer to Thursday and Friday. We will also need to watch the severe potential with these storms, especially Friday. The 12z GFS showed a number of severe parameters, especially across southeast Colorado for the Friday timeframe. In short, will keep things broad-brushed for warm and dry through Tuesday across eastern Colorado, gradually cooling and becoming more unsettled as we head into the latter half of the week.